"I ate my last crunchy Peanut Butter cups yesterday. Can you make some more?" declared Sid before boarding his school bus. He was talking about Toasted Quinoa, Dark Chocolate and Peanut Butter Cups, which is a pretty much his favorite after dinner dessert situation. 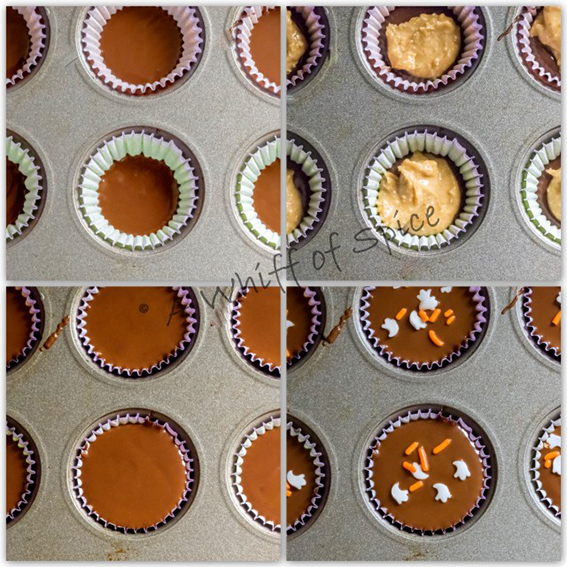 This being October, with Halloween just around the corner, I decided to make a copy-cat recipe of Sid's favorite candy - Reese's Peanut Butter Cups. And boy! Was he impressed! The internet is filled with copy-cat recipes of Reese's Peanut Butter Cups. Most of the recipes calls for Powdered Sugar/Confectioner's Sugar, Butter and Milk Chocolates. Even the label on the Reese's Peanut Butter Cups doesn't boast of great ingredients either. But you guys know me. I come up with weird ingredients and combinations that's not only tastes great but are good for you too. For this recipe, I have used just two ingredient. Honey Roasted Peanut Butter and Dark Chocolate (65% Cacao). I have used a smattering of Halloween sprinkles and some coarse salt too, but that is purely optional. I get my Honey Roasted Peanut Butter from Fresh Thyme. They have these huge grinders filled with toasted nuts and you can make your own nut butters. They are absolutely preservative free and have only 1 ingredient - toasted nuts. No additives or preservatives. I get my stash of Cashew and Almond Butter from there as well. If you cannot find fresh Honey Roasted Peanut Butter, Justin's Honey Peanut Butter great too. Or you can also add pure honey to regular peanut butter and use in this recipe too. Any kind of chocolate works for this recipe. I have use Bitter-Sweet Baking Bar with over 65% Cacao. Firstly, we love the Dark Chocolate. Secondly, the darker the chocolate, the more potent is it's antioxidant properties. 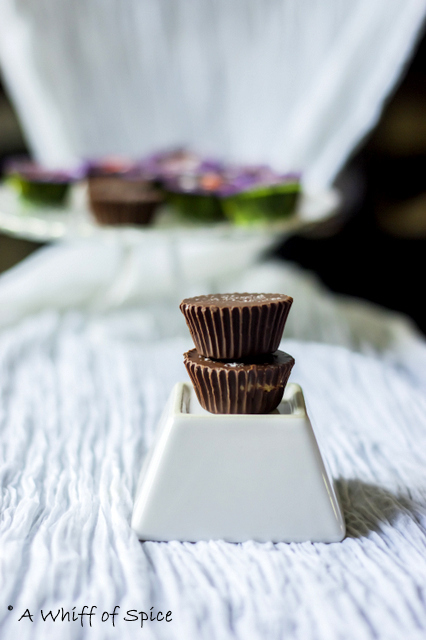 These 2 Ingredient Peanut Butter Cups tuned even better than the real Reese's Peanut Butter Cups. They were absolutely melt in the mouth. The combination of mildly sweet and creamy Peanut Butter with the bitterness of the Dark Chocolate with a salty crunch from the Sea Salt, was to die for. 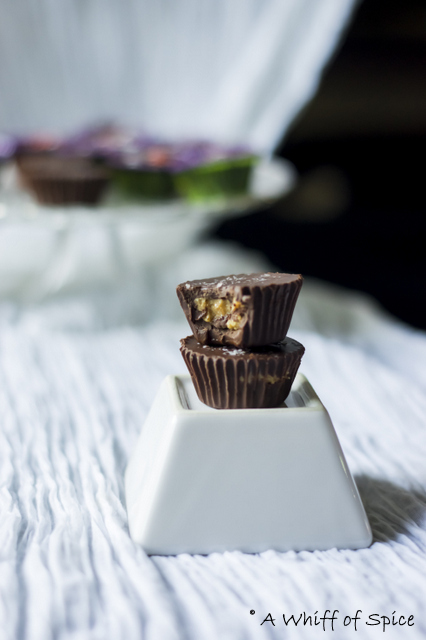 The only down side of this recipe is that, because of lack of additive, preservative and stabilizers, these 2 Ingredient Peanut Butter Cups tend to melt very easily. It needs to be kept under refrigeration at all times. 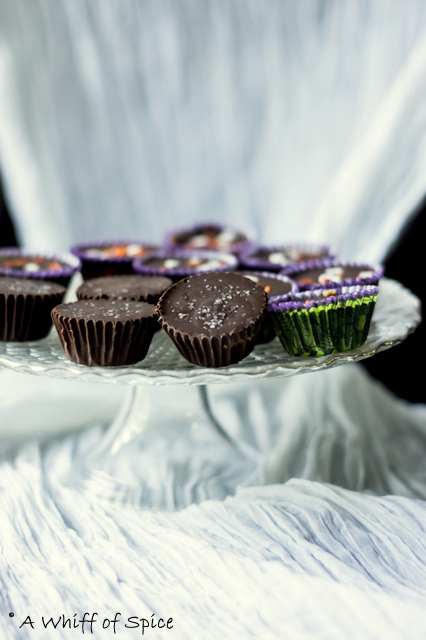 We are totally in love with this 2 Ingredient Peanut Butter Cups. And I'm sure you will be too, one you try it! 1. In a microwave safe bowl warm the peanut butter for 15 to 20 second till soft and at a pourable consistency. 2. Add the chopped up chocolate in another microwavable bowl and melt it too. Do it in burst of 20 seconds, so that it doesn’t seize up or burn. Mix well after each burst. 3. Line a mini muffin pan with paper or silicon liners. 4. Spoon about 1 teaspoon melted chocolate into each lined muffin cup. Tap the muffin tin lightly, to spread the chocolate. 5. Spoon ½ teaspoon of slightly melted peanut butter over chocolate. Tap the muffin tin lightly again to spread. 6. Top it off with 2 teaspoon of melted chocolate. Tap lightly to spread everything evenly and to get rid of any air bubbles. Add coarse sea salt if you wish. 7. Refrigerate the tin for about 30 minutes for the cups to harden. 8. Peel the paper liner and enjoy! 1. Since the chocolate doesn’t have any stabilizers added, it melts quickly. Keep under refrigeration at all times. 2. If honey roasted peanut butter is not available, use regular peanut butter. Add a tablespoon of honey or maple syrup and warm in the microwave for 30 seconds till soft. Mix well and use it as per the recipe. 3. If using chocolate chips instead of bar, add a tablespoon of vegetable or coconut oil, while melting. It prevents seizing. Peanut Butter and Chocolate is an awesome combination and one of my favorite. But there is a scientific rational to it too. About 90 percent of taste is the result of smell. In case of peanut butter and chocolate, the complex interplay of their odors works very well. The flavor and composition of roasted nuts are close to those of cocoa beans, but complementary. The soft nut oils add some punch too. If they mix with the cocoa butter, it causes everything to melt more quickly in your mouth, releasing the flavor in a burst. At the same time, aromatic compounds like pyrazines are also lighting up your limbic system, a brain region that controls your memories and emotions. This boosts your feelings of satisfaction by tapping into deep-seated memories of moments when you indulged in the combo. Peanut butter delivers appetite-satisfying protein, and it's a good source of monounsaturated (healthy) fat. Some research shows that eating a vitamin E–rich diet reduces the risk of stomach, colon, lung, liver, and other cancers, but, as with other antioxidants, vitamin E supplements have largely struck out. Adding vitamin E–rich foods like peanuts, peanut butter, almonds, almond butter, and sunflower seeds to your diet will help keep your cells' defenses strong. 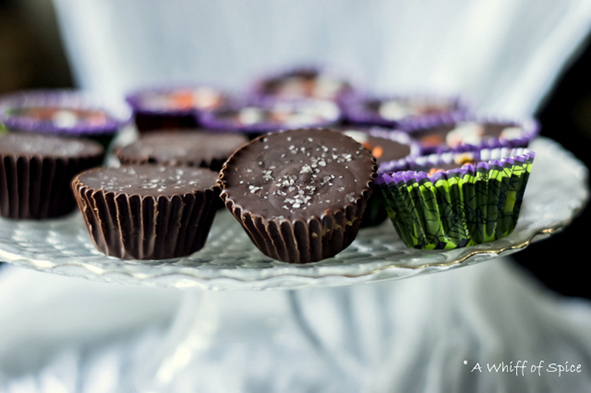 I cannot wait to make these peanut butter cups! They sound delicious and easy. I love your website and the recipes look very doable. That is the point at which I enlightened him regarding Merchant Cash Advances! Tours like https://www.imanali.in/manali-tour-packages-hyderabad can turn out to be great and interesting. All you need to do is look for a place which has everything in the lot. Do not look for a place which does not have much to offer you. Tours are something which can add vigor to your life again.